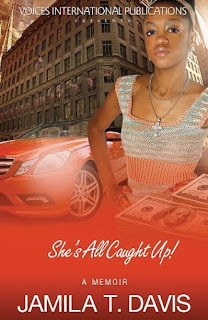 Jamila T. Davis, Author of She's All Caught Up! Today we are interviewing Jamila T. Davis author of the inspirational memoir "She's All Caught Up." My name is Jamila T. Davis. I am a motivational speaker, prison reform activist and the author of several books geared to inspire, empower and uplift readers. I call myself a champion of those who are considered "under dogs." I want them to know that despite our past circumstances in life, or our current conditions, it doesn't have to dictate our future. My book is a cautionary tale that illuminates the everyday problems that youth face, such as peer pressure and the desire to be loved and accepted. I openly expose my flaws and my weaknesses with the hope that readers will have the courage to do the same. Who would you think would most appreciate this book? I believe teens and their parents would benefit the most from reading this book. Teens can relate because many of them are experiencing similar situations. As adults, we often forget the struggles we encountered "coming of age." Therefore, this book is a good reminder about the thought process of teens, which will ultimately equip parents to relate to their children's inner struggles. At an early age, you distinguished yourself as a well-behaved child who earned excellent grades. But in high school, you switched gears, becoming a rebel and living life in the fast lane. What prompted you to make this transition? Like many teens, I wanted to be cool. The desire to be loved and accepted, and gain notoriety, was huge driving forces for me. Then, quickly after I began living life in the fast lane, I became addicted. I craved the power and respect it garnered me, which led me on a long, "wild-goose" chase. What do you think are some of the biggest challenges teens face today? By far, peer pressure tops the list! We tend to want to follow the lead of those around us whom we admire. Therefore, it is essential for parents to analyze the role models of their children, and expose them to quality leaders who teens find to be cool and inspirational. What role do you think parenting plays in teens going astray? Do you have any advice for parents? It's important that parents encourage their children to become independent. That doesn't mean you always let them do what they want. Instead, you provide options and help them develop good decision making skills. This will be one of the best tools you help them to develop. Then, regardless if you are around, or not, they will be programmed to do the right thing. When parents are too strict, children ultimately rebel. Even worst, they won't open up to you, so you will never know what is truly going on in their lives. I am writing the sequel to "She's All Caught Up," which illustrates my adult years. Now that readers understand how I framed my thinking, they will see how the vicious cycle of poor choices continuously caught up to me. I am currently serving a 12 1/2 year sentence in federal prison for my participation in a multi-million dollar fraud scheme. From local drug dealers and hustlers, my desire for power lured up the ranks to rappers and professional sports figures. Although my lifestyle improved substantially, my warped thinking patterns didn't. As a result, I had a hefty price to pay! Most memoirs are written to tell you about how perfect a particular individual was and it highlights all their accomplishments. Although these kinds of books can be inspirational, they often don't reveal the truth and the hidden stuff that people can learn from. We live in a society where we are taught it is acceptable to wear "masks," pretending everything is good, when it really isn't. I wrote my book to expose the deep dark secrets that haunted me for many years. Acknowledging my faults and my mistakes empowered me to make necessary changes. Today, even though I am behind bars, my spirit is free. I know who I am, where I am headed, and I don't have to look over my shoulders. Many people who are free can not honestly make that statement. My book is written for those who have the courage to be honest with themselves. It is the truth that will empower readers and provide a real foundation to receive true liberation from the inside out!